As mentioned in the post Hiring is more emotional than rational technical skill rarely assures success in an organization. There are just too many elements that impact someone’s success that are more important than technical fit. Many times when you plant an individual into a team, business unit, or client site there is potential damage that no amount of technical skill can hide: personality clashes, culture clashes, communication gaffes, and other social or relationship awareness miscues are a few with the potential for huge impact. Hiring is more of a cultural match than a technical match, at certain levels you can expect people are smart enough to build or expand their technical skills, but can you expect them to build their personality skills. These problems can be immediate or on a slow boil, but make no mistake these problems affect morale and motivation of all involved. These problems drain resources and cost the company recruiting dollars and replacement dollars. But let’s go back to the beginning: recruiting. [W]hen Jim Collins wrote his bestseller, Good to Great, a study of companies that did outstandingly well in their industries, he found that the best companies were definitely not those whose bosses had marquee value. Rather, exceptional companies were disproportionately likely to recruit their bosses internally. And those they selected were half as likely to appear in newspaper articles as the bosses of less successful companies. Booz, a consultancy, calculates that four out of every five CEO appointments go to insiders. Those insiders last almost two years longer in their jobs than outsiders. What both articles highlight are the costs of bringing in an outsider or the cost of culture. An internal candidate certainly understands culture. Hiring a superstar who does not gel within a culture is a waste of effort. This is not the failure of the person, but a failure of the recruiting process. The recruiting team, from HR through the hiring manager, drops the ball when they do not identify fit. But please, PLEASE, don’t just bandy about culture as a weapon most often used to fire a person with the wildly esoteric, “you don’t fit the culture”. Culture as a weapon is a rather cowardly strategy, particularly if you have not truly identified the behavioral competencies that needed to succeed within the culture. Do not, with good conscience, bandy about culture until you at least base line what your culture is and map those behavioral competencies most aligned. It is highly likely, as your organization succeeds, your organization will undergo different culture phases. In line with revenues growth your organization has new hiring needs. When you know culture you can strategically hire those who might help take your organization into the next phase. In growth, as well as organization maturity, what becomes important is an ability to identify the key traits, values, behaviors, and norms of the culture and to create behavioral questions to identify how well a recruit fits or does not fit. The Competing Values framework allows you to identify how your organization values ability and the norms of getting things done. When we recruit people, or as an NFL team might draft talent, we really have to look at a person’s fit on at least 4 levels and critical to understand these levels you need to understand organization culture. If you care about diversity, someone who does not fit your culture can indeed be a strategic hire, but for that strategy to work, there needs to be high regard to coach and cultivate cognitive diversity, not just qualitative diversity. This means you and your organization meld diverse views and that no singular view is trumped; that is diversity. The Competing Values Framework identifies “how things are done around here” or better known as: culture. When I pair EI with the Competing Values I get a view of an individual’s likely behavioral competencies, how they work and motivate others, and how the culture, individual, and team interact. 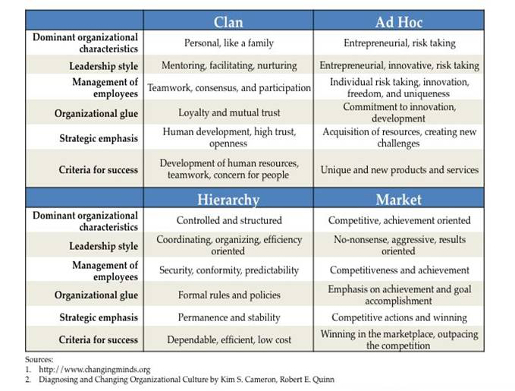 As the matrix below outlines, there are distinct competencies the lend themselves to different cultures. Your team’s job is to craft the questions during an interview process that identify fit. Neither EI nor Competing Values should act as a final assessment of fit. They are part of the final piece. The danger of using it as assessment of fit is clear because people are smart enough to game the results. Both Emotional Intelligence and Competing Values Framework should be part of the total picture of fit. The sooner you understand the culture the sooner you can move beyond technical excellence and into collaborative or emotional intelligence. Does your organization have a consistent, organization-wide recruiting strategy? What is your on-boarding strategy to integrate new employees? I believe you can find some recruiting or interview questions to ask around each of the cultures listed above. Obviously, the first step is to identify your culture and that can be done with a culture survey – guess what, if you get in touch with me and I can administer and diagnose your culture. In the prior post, Hiring the right person is more emotional than rational I mentioned I would give sample questions to tease out emotional and cultural fit, I’ll provide questions in a follow-up post titled: “Hiring questions for emotional and cultural fit”. Don’t let your recruiting strategy turn into a crap shoot, most organization experts believe it takes 1 year for a recruit to integrate and to get up to speed enough to begin to earn their salary…caveat emptor.